SF Sketchfest - Audible Presents: The Pole Vault Championship of the Entire Universe with Bill Corbett, Conor Latowska, Kevin Murphy, Eric Martin, Andy Richter, Eliza Skinner, Paul F. Tompkins, Janet Varney and "Weird Al" Yankovic! 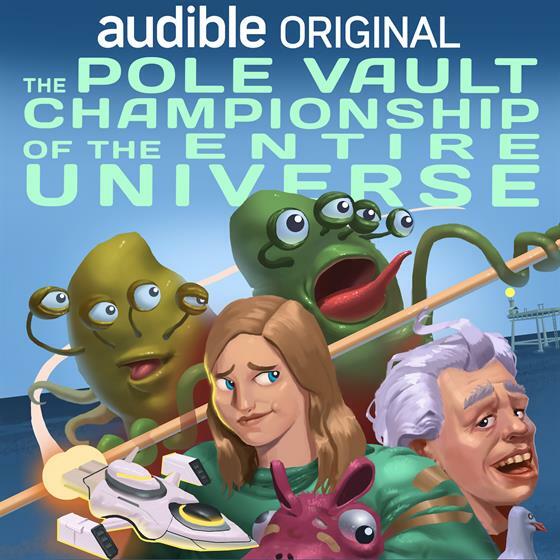 Audible Presents: The Pole Vault Championship of the Entire Universe with Bill Corbett, Conor Latowska, Kevin Murphy, Eric Martin, Andy Richter, Eliza Skinner, Paul F. Tompkins, Janet Varney and "Weird Al" Yankovic! Building on the sci-fi-comedic lineage of "Rifftrax" and "Mystery Science Theater 3000," "The Pole Vault Championship of the Entire Universe" is an Audible Original that follows Kara Everglades as she is caught up in her grandfather Cornelius’ harebrained scheme to legitimize his island micronation by hosting a sham Olympics there. Unfortunately, the games have also attracted the attention of an alien named 9-Krelblax, who has set a course for Earth to prove his planet’s dominance. Come see a live reading of excerpts from a brand new, out-of-this-world Audible Original (coming soon to Audible!). Pre-order and learn more at Audible.com/PoleVault. Featured performers: Bill Corbett, Lucy Davis, Kevin Murphy, Andy Richter, Eliza Skinner, Paul F. Tompkins, Janet Varney, and "Weird Al" Yankovic!